Another ‘no-cook’ recipe – unless you count toasting some walnuts for a few minutes, this salad is very nice indeed – very refreshing and pretty simple to make. One thing that always puts me off salads with mango is I am rubbish at breaking down a mango. I always make a mess and end up gnawing on the stone like a dog with a bone – just because I don’t like wasting any of it. Mangoes are a very inconsiderate fruit. I mean why put such a large stone in a fruit that big. Once you’ve removed all the flesh, julienning it seems to be just one step too far. Although on this occasion I seem to have done quite a good job. Pomegranates are another one of those fruits that makes you just want to buy a pot of the seeds. That said the seeds are never as juicy as buying a fresh pomegranate, cutting it in half and whacking the back of it with a heavy spoon (or my preference the pestle from my glass pestle and mortar). All I’d say is whack them into a separate bowl rather than over the fennel like I did – as the juice splashes everywhere and makes the fennel look like it took part in a horror movie. That’s as hard as the prep gets though. 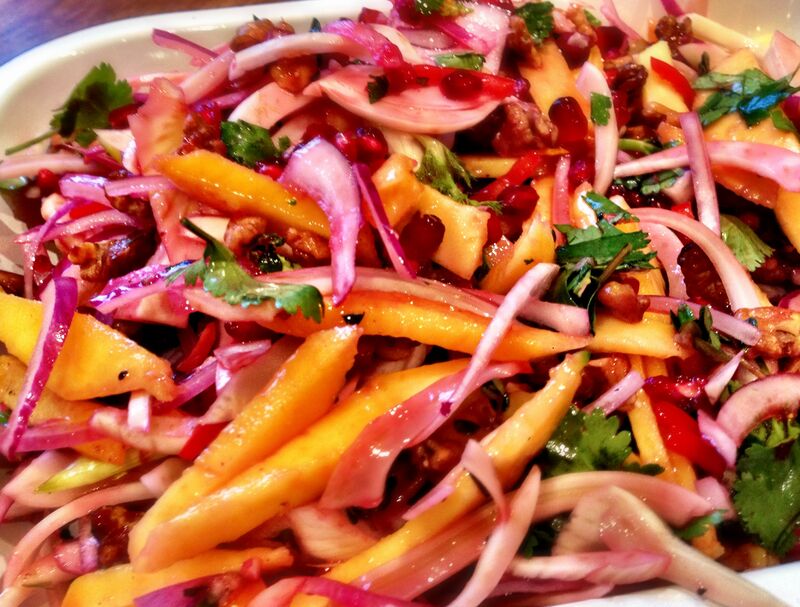 Just add the mango and pomegranate to some sliced fennel, sliced red onion, red chilli and the toasted walnuts. Toss it all together with some lime juice, coriander and lemon thyme. This is a wonderful salad and can be found in ‘Friends Around the Table’ by Acland Geddes and Pedro da Silva. This was again taken from a pullout from the Times Eat Magazine. This entry was posted in Magazine Pullout, Vegetarian, Want to make again and tagged Fennel, food, Mango, pomegranate, recipe by tenuoustoaster. Bookmark the permalink.